By the time Hopes&Fears arrived at New York offices of 4REAL on Friday afternoon, their latest venture Clone Zone had gone viral. Early on, somebody used the app to spoof news coverage and incessant speculation surrounding Elizabeth Warren running for president. 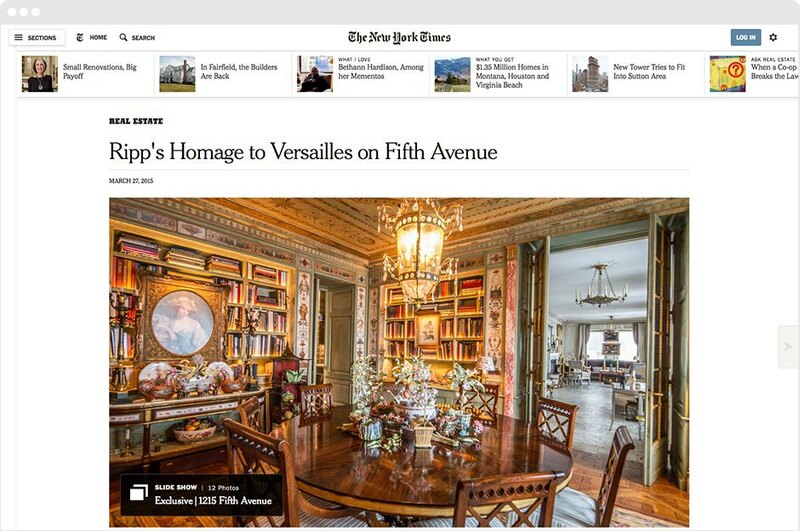 Just hours earlier, the New York Times "ran" a very informative exposé on artist Ryder Ripps' "homage to Versailles" in his Manhattan condo. And what took their web cloning tool to the next level? Reddit, of course. Less than a day after its launch, the parodying app was featured on the forum's Web_Design sub-reddit, and the number of live users on Clone Zone grew exponentially. If the website is down now, chances are it's crashed again due to its overwhelming popularity. But what about making uncanny fake news resonates so strongly with a 2015 audience? 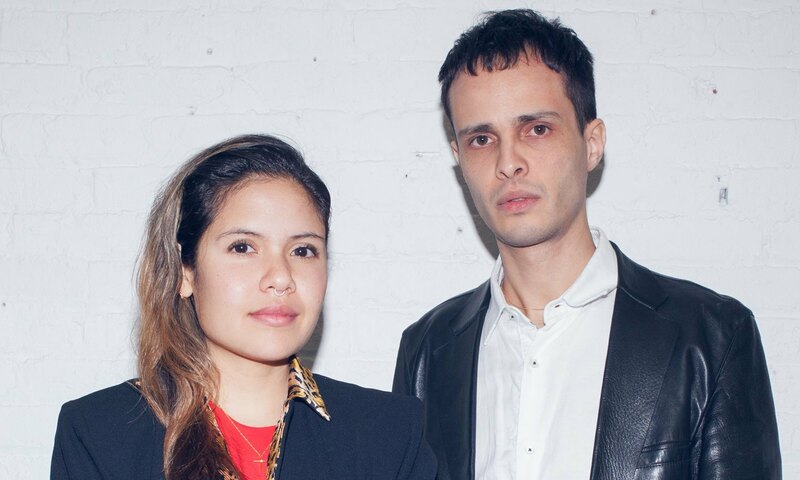 We talked to Slava Balasanov and Analisa Teachworth, founders of the 4REAL digital agency. Slava Balasanov: The time is right. I started [making Clone Zone] about two years ago, but my expertise wasn't at the point where I could easily do it. I just finished [recently]. There’re so many advancements and features that make it really easy to build interfaces for people to manipulate. Analisa Teachworth: Seeing where the Facebook feed is going and the way that modern journalism has taken a turn, [everything seems] very chaotic. We felt that it was the proper time to be able to make fake information. Why not now? It’s now or never. 4real digital agency specializing in designing and building scalable technology-driven websites & apps for the real world. Slava is a musician and visual artist working in the realm of digital culture and technology. 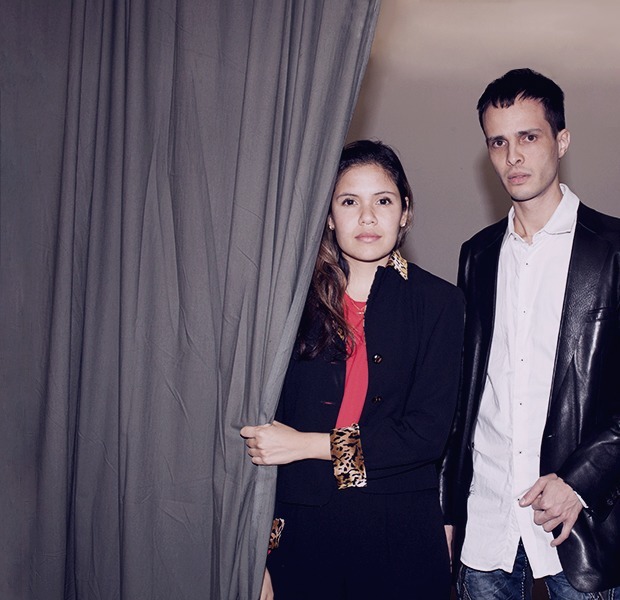 He co-founded and operates Moment Sound Recordings. Analisa is a new media artist and art director who explores systems and communication through self-made experiments. She frequently gives lectures. Her work has appeared at Art Basil Miami Beach, among others. H&F: What is the appeal of fake information? SB: I think it’s a conceptual idea. What is real information and what is fake information today? Who can you trust and who can’t you trust? There’s so much going on with privacy and surveillance in our culture, beyond the obvious things that are [being reported]. I think that tools like Clone Zone are just a product of that. There’s a ripple effect that happens. I think that everyone feels that it’s out of control. 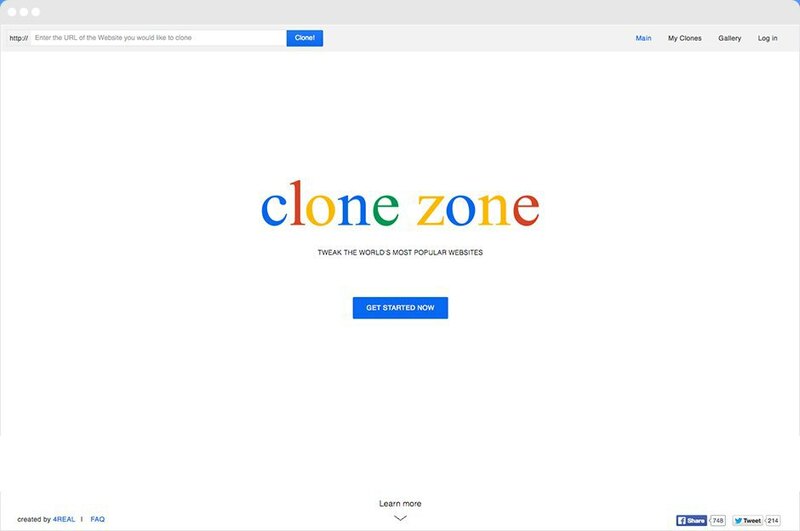 ↑ Clone Zone is an online tool that enables you to clone websites. Users can clone any site they like, edit content like text and images and share the results on social media. AT: Clone Zone is an extreme version of that situation taken to an absurd degree where you literally go and do whatever you want. But, to an extent, that’s what governments and news organizations [have already been] doing. Even sources are driven by sensational information and clicks. There’s this story that came out in The New York Times today about Hillary Clinton's ties to Putin and about her giving him rights to use Uranium. The first headline was way more sensational. Then, they changed the headline to tone it down, to make it a little more ambiguous. SB: That has been happening in journalism forever. Those institutions are now also subject to the whole hyper-internet complex where they want “likes” and they want big numbers and they want an Instagram following, Twitter followers, and everything else. Clone Zone is an extreme version of that situation taken to an absurd degree where you literally go and do whatever you want. But, to an extent, that’s what governments and news organizations have already been doing. SB: There’s almost no way to get through to people because there’s so much information, so many sources. To get any kind of response, you almost have to make it sensational. The pool is so large. There’s so much competition that if you don’t have a massive team working behind you, it’s hard to even break the barrier, even if you have a story that is real news that needs to be told, it doesn’t even get out there. I mean, it’s incredible. H&F: Now that Clone Zone is viral after being posted to Reddit, have you taken a look at any of the content? SB: A little bit, but there’s been so much that it’s hard to go through it all. A lot of stuff people are posting on Reddit are little inside jokes that only a selective group of people would understand. When we first launched, a journalist asked us, "What are you going to do when this thing starts taking off?" We didn’t think that we would get that many users or that it would happen so fast. H&F: How many people are on the website right now? H&F: What was the average user count as of yesterday? SB: It started at 20 or 40 live users at any given moment on the website, up to 400 by the end of the day, and now it’s 1500. We posted it on some Polish site similar to Reddit, so there’s all these Polish clones. I shared it with some Twitter followers in Japan, so now there’s a bunch of people in Japan making clones. So much of the internet is based on mindless consumption of these web pages. I think it’s really cool to turn it around. H&F: The first thing you see when you start it up is Google's logo, which might be one of the most iconic logos of the 21st century. In a sense, these clones form a dialogue. Is that something you’re seeing now or is there too much information to fully grasp what Clone Zone is doing? SB: I think it’s definitely starting a long debate on Reddit. A lot of people are talking about how this is sort of a simple phishing site or could be seen as a phishing site. AT: We went in with the original idea to use Clone Zone as a social network, as a place where people can create together and also change each other’s things and make things and talk about what is going on within the zone. If there were more UX features—user profiles or more of a chat box for people to talk to each other—I think it could have a really long life. h&f: Did you factor in the possibility that this could be used for cyber bullying or character assassination? AT: We did. Cyber bullying is really scary. I think that there might be some way of implementing a structure that helps us detect really awful things. We don’t want anything really destructive to come from this. There’s going to be an issue about how you control that aspect when it’s being populated so much. How do you even see that? It’s our tool, so we have control over it. If something comes up that’s really against what we stand for, we have no problem removing it. SB: [We’ll come up with] self-administrating tools for the users, where they can flag stuff, at least to make us aware. So far, we don't have the resources to build out a more complex system. But we do have our admin account. H&F: What are your personal desires for the project? Topical discussions? The curation of artistic or social endeavors? SB: We’re really interested in people using this tool to create some sort of quality content in a critical or subversive way. It’s great if people start creating really funny posts, but ideally they would also have something to take away and a good agenda behind it. AT: I hope people will be able to use it to shake things, to make people really think about what media is and the ways they get information that they trust. H&F: What do you see as far as the continued spread of the site? SB: I hope the chat room does well. I hope the servers don’t crash. We’re really curious about what opportunities might open up once we do have a really big user base. Part of the problem is that there’re some legal issues. [We’ll eventually] need to start worrying about that, and if we can transform it into a tool or a business of some sort. We haven’t thought about it that much. H&F: With Clone Zone, there is an opportunity to break down the difference between a private interest and public domain. You launched it with a clone of Tech Crunch. Now everyone can suddenly appropriate certain websites and their iconography to launch a platform or announce a project. I’m curious as to whether or not you factored in that possibility from the get-go. SB: Oh yeah, we definitely wanted to give people the agency to create more in a general sense. So much of the internet is based on mindless consumption of these web pages. I think it’s really cool to turn it around. AT: The question is about advertising. Why is advertising so trusted in the first place? Why do you see a logo and, automatically, your brain says “Oh, yes!” It’s completely indoctrinated in our society at this point. SB: For instance, the Google logo. I think it’s the most seen logo in the world. AT: It’s going to be interesting to see cease and desists eventually and how those will play out. H&F: How would a cease and desist work, if it’s entirely user created? SB: They can still definitely go after the company. At Pirate Bay and many others, the content was provided by the users. The websites were facilitating it. If there was a cease and desist, it would probably be from a specific source like The New York Times, and then we’d just get rid of all The New York Times stuff. There’re start ups where you’re just like, “What?” I can’t understand; I don’t know; it doesn’t all make sense; it’s just so silly. This just goes hand in hand with that; that’s what we were trying to do. H&F: But what kind of process does that actually start? Because from there, things could snowball. AT: There’s no money here. There’s no revenue coming from this. SB: We don’t have the resources to fight. H&F: That’s what’s so curious to me. 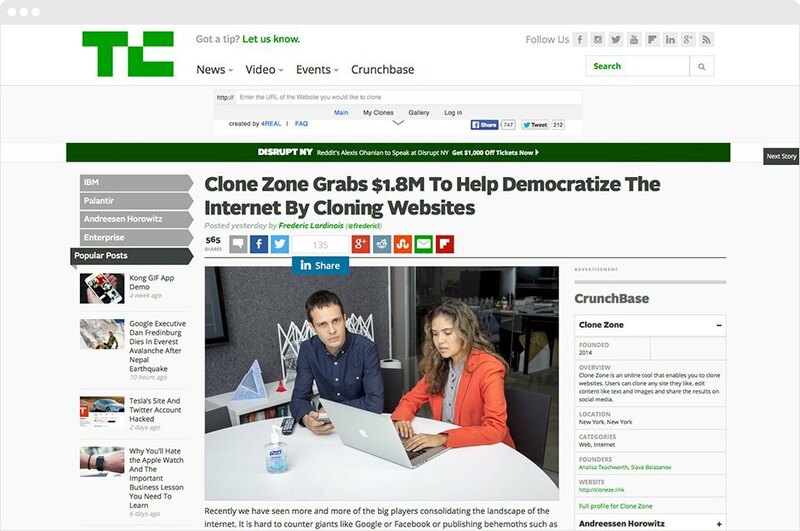 Clone Zone takes established products, established platforms and websites and almost puts them entirely into the public domain, because no one is making any money. AT: We’re very happy with what’s happened so far. I think that it will be interesting if we can get a good network of people to keep on coming back to the site and not just do one thing and never come back again, if we could actually get users who want to keep creating. h&f: Before the posting, did you have a small core fan base? SB: There was a core group of people making stuff, so it was good to see that it didn’t just fizzle out immediately. There’re a lot of really good ones. If there were a cease and desist, it would probably be just from a specific source like The New York Times and then we’d just get rid of all The New York Times stuff. AT: The Tech Crunch one, which was a parody on corporate culture, was passed around a bunch to the point that the head of the board at the New Museum had read it. H&F: For something that is, in every sense of the phrase DIY, 1.8 million is a huge number. AT: There’re start ups where you’re just like, “What?” I can’t understand; I don’t know; it doesn’t all make sense; it’s just so silly. This just goes hand in hand with that; that’s what we were trying to do. H&F: Have you engaged in dialogue with Silicon Valley since this launched? AT: I think we would love to be in Silicon Valley though. We want to stay here in New York, but there’s a lot going on over there, people are way more open-minded and I think people on the West Coast have a different vision of the internet and the future and what it holds. SB: I think we’re more interested in exploring things and playing around [right now]. h&f: In 2015, in a media landscape of fact-bending and clickbait, do you perceive facts to be the enemy or the friend of truth? SB: I think both "truth" and "fact" are becoming more complex concepts. They’re not these absolute things anymore. It's really easy to take small bits of facts, take them out of context and totally change the meaning of something. I think everything has to be analyzed from that perspective instead of an objective single thing, as in, this is the truth and that’s a fact. AT: Most people know that the media is totally uncontrolled and they should take everything with a grain of salt. It’s like with global warming; we all see the effects of climate change but still the majority of people that live in America don’t think that global warming is real. The bigger question is how you frame your reality and how do we interface with the world. SB: It’s easier than anything else to get the facts, but you actually have to make an effort to do so. Most of us get our information through these feeds that are basically fed to us by algorithms that Facebook designs and that Google does, to an extent, with its searches. AT: It’s the machines! It’s programs that are defining things. It’s not even one person saying this is fact or this is not. It’s a machine. SB: I think Reddit is cool because it generates this feed that’s based on likes, but you can customize it, you can at least get the stuff that you like and it’s not based on your immediate social network. It’s not like Facebook. It’s based on people that are maybe totally outside of your social network but are interested in the same thing. AT: We’re interested in that kind of democracy. That’s sort of more honest. It’s the machines! It’s programs that are defining things. It’s not even one person saying this is fact or this is not.